Time to go into the archives. 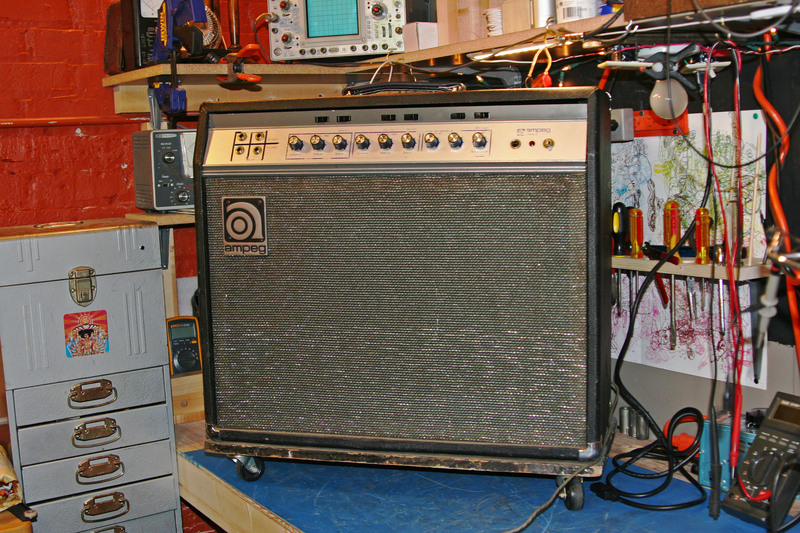 Old Ampeg Gemini GV15 from late 60s or so. Has a single 15″ speaker to handle the 50W or so. Nice wheels since it’s a backbreaker. But also it always makes me cringe when I see people rolling amps down the sidewalk so I’m actually not a fan of them. More a fan of broken back and unjostled amp. Sacrifice. R73 470 ohm 2W power supply dropping resistor was burnt and the amp had a bias problem that was making the power tubes red plate. R73 probably got toasty because of bias problem causing excessive plate and screen current when tubes were redplating, I’d guess. Interesting that R73 should be damaged because that’s the same resistor in Ampeg V series that sometimes has trouble. In V4 it’s R53 470 ohm 7W and V2 has R55 1K 10W (higher resistance and higher power rating in V2 because since it has 2 power tubes compared to 4 in V4 and same power transformer, the power supply voltages are not as loaded down and power tubes are in the 580-590V territory instead of 530-540V for V4). This resistor in all these amps is a power supply dropping resistor that takes place of where a choke would be in amps that have them, decoupling the B+ and screen supply. There is a heavy current that flows in this resistor when the screen current increases, essentially when you’re playing loud. Play loud enough and enter into power amp distortion territory and the screen current increases exponentially. You probably won’t run into this too much with Gemini series players since maybe they’ll be more clean and lighter rock players (2W resistor) but with V series powerful rock amps definitely. So I guess they needed 7 and 10W resistors for V4 and V2. I think 10W is a good minimum in this position for either of these amps. Some Traynor amps had 20W resistors in this position FTW. Anyway, check out the square black module in the upper right. It is the vibrato module which has two lamps and photocell encapsulated in plastic (maybe bakelite or something??). The vibrato on Geminis is really awesome I must say, and it has a forward and backbeat function which is some function of the dual lamp setup in the vibrato module. Really cool and good sounding vibrato. 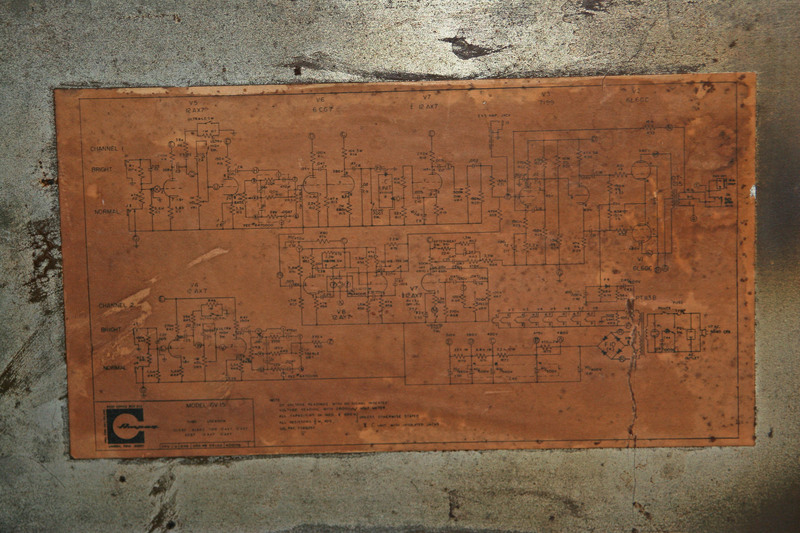 Well, not the greatest focus but you gotta appreciate the realness of this Ampeg GV15 schematic. Pasted in the chassis — the usual Ampeg-style nice touch for service people.